Great Spring Break! Beautiful clean condo with amazing view! My family (husband, young daughter, and myself) enjoyed our spring break in this wonderful condo. It was the my daughter's first time at the beach, and she was able to not only enjoy the beach, but sit on the balcony and enjoy the view. The gulf view is AMAZING from this very neat, clean & comfortable unit. Fun little places to eat nearby. The owner manages her own unit so if you have questions or concerns she is available. White sand & cool waters await you - enjoy!! Great condo! The view is amazing. Teri has thought of everything you would need in a home away from home. Wonderful size and two full baths were great to have. Definitely want to come stay there again. We have stayed in this condo before and it ever disappoints. The condo is very comfortable and cozy. The location is perfect. We feel at home here and hope to be back next year. Thank you Teri for your accommodations - you are a pleasure to work with. My husband and I booked this condo for a quick anniversary trip. It was perfect for us. There was plenty of room even if we had brought our 2 daughters with us. There were already 2 beach chairs and 2 umbrellas in the condo so we didn’t have to rent any. The place was immaculate. The views from the balcony were beautiful, and I really enjoyed laying in the lounge chair on the balcony watching for dolphins. The location was close to many restaurants and of course the shops at seaside were within a 10 minute drive. We definitely plan on renting this place again. 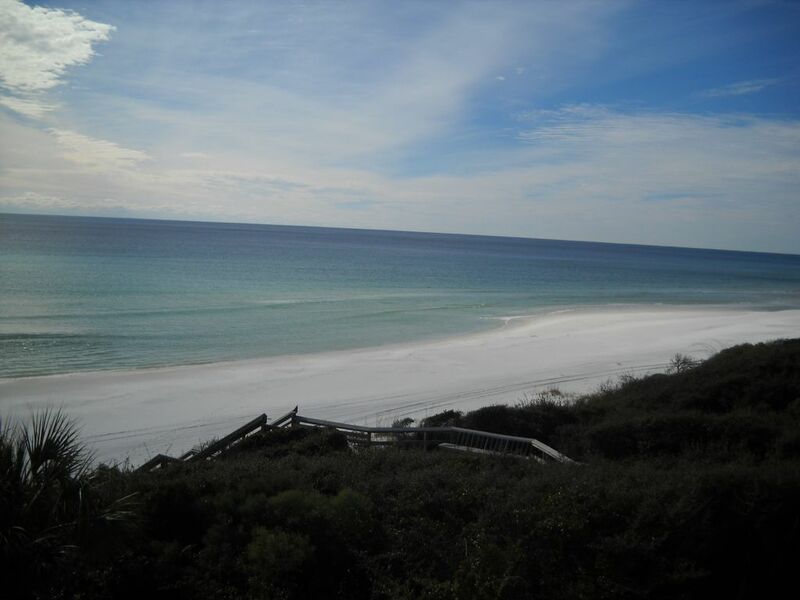 Great condo with a perfect view, and easy beachfront access. This condo was perfect for our family of four. It is on the third floor, so be warned if stairs are an issue for you. They were not an issue for us, and we preferred the third floor for the fantastic beach view. That balcony / view is well worth hauling everything up and down the three flights of stairs. Teri was so easy to work with. She responds right away via text, email, and answered calls. The unit itself was clean, seemed to have very nice new carpet, and had everything we needed to cook dinners each night. My kids are young and short, so they loved the hidden bunk beds. If your kids are older or tall, the bunk beds could be an issue, but she does have a pull out sofa in the living room. My only small complaint is the Beach Chairs For You Company that works right in front of the condos. If you are renting from them, then you will not have any issues. If you bring your own tent and chairs, then you better plan on being down on the beach before 5:20 am to beat them, or they take up all of the waterfront access. Getting up that early was not what I preferred for vacation, but whatever, I wanted water front Our days so just be aware. If Teri will have us, we will definitely be back. Le Palms at Seagrove est situé au cœur de la plage de Seagrove. Niché directement dans le golfe du Mexique, à quelques pas des restaurants, des boutiques et des activités de la région. Scenic 30-A a un sentier pavé pour des kilomètres de jogging et de vélo. Location de voiturettes de golf et de vélos par l'intermédiaire de vendeurs locaux.